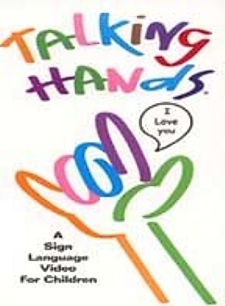 Talking Hands� introduces young children to more than 30 words using American Sign Language (ASL) and Signing Exact English (SEE). Your child will love to immitate the other children and adults on the video as they demonstrate each sign. Children have the ability to sign even before they can speak. Talking Hands� is perfect for family interaction and quality bonding time and is fun for everyone! I LOVE this DVD. My girls are now 16 months. Before I purchased this video I had a couple of baby sign language books and a set of "flash cards" so I had been using a couple of signs since the girls were about 6 months old (more, milk, and no). I got this video in January (the girls were 14 months) and the girls and I can now communicate as we have all learned the basic signs. They can sign more, milk, cookie, night-night, drink, Mommy, Daddy, eat, and "all done". They actually will watch the video when I have it in and sign along with the kids and adults. My twins were 5 weeks early and the only thing I have been concerned about is their language developement. Although their doctor says their fine I had no way to know what they wanted and it was frustrating for all of us. Now, they can "tell" me what they want and it is great. Also, their language developement is getting better as they try to say what they are signing. I highly recommend this video to ANYONE with babies/toddlers. I was so amazed at the easy to follow format and how entertaining it was for my 1 yr old (and myself). Though neither of us is in special need of it, I wanted her to learn to sign so we could communicate easier and it is working! It's great to see her get excited when she tells us something and is understood. I wish there were more videos like this. A co-worker first told me about "signing" videos and how well it worked for his much younger son. At 1yo, my dau. had only muttered a few words early on then stopped all verbal communication. I tried the video. We watched it many days while she was captive to the highchair for brkft/lunch. It kept her attention everytime. However, Daddy and G-ma would rather watch paint dry. After only a couple weeks we were ALL amazed when she started using the "signs"! Her first "word/sign"...PLEASE which makes her Mommy proud. It also helped with her verbal communication as she would repeat the words back to the video. Try it, it really works and best of all she is still watching it intently almost 1yr later!